Yakutsk is synonymous with intensity. During summer, thermometers often boil to 30°C. Despite the extreme weather, Yakutsk is 200,000 residents strong and growing, quickly becoming one of the Far East’s most vibrant cities. The city is capital of the Sakha Republic, a vast territory about the same size as India, but with a population of just under a million. Yakutsk is mainly populated by the native Yakut, Evenk, and Even people. For anyone interested in Russia’s most isolated corners, visiting Yakutsk is a must. 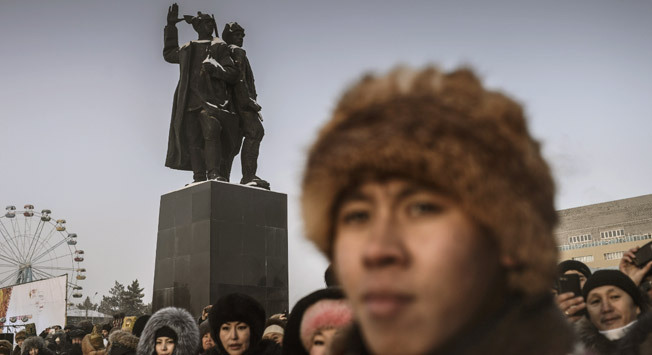 A band of Cossack explorers founded Yakutsk in 1632. It remained a small outpost until the late 19th century when gold was discovered in the region. Building one of the world’s most northern cities has come with its challenges; Yakutsk rests on permafrost and many of the buildings are constructed on stilts to retain stability. Before the Russian conquest of the Far East, most of the native people in the Sakha Republic were semi-nomadic and herded reindeer. Many converted to the Russian Orthodox church and were later required to learn Russian during the Soviet era. Yakutsk has a number of resources where visitors can learn about the region’s unique history, all located in a downtown one can easily explore on foot. If you’ve arrived in Yakutsk after a long overland trip and are in need of a coffee fix, start your first day at Jonathan Kofeynya (26 Ul. Yaroslavskogo). Next, walk south down Ul. Yaroslavskogo and turn right on Ul. Kulakovskogo towards the Mammoth Museum (48 Ul. Kulakovskogo). The layer of permafrost which Yakutsk rests on preserved many of the mammoths that once roamed Siberia. On display are mammoth skeletons as well as taxidermies of these ancient mammals. The adjacent Archaeology and Ethnography Museum provides insight on the culture and life of the Sakha Republic’s natives. Afterwards, turn east on Ul. Kulakovskogo, and take a left on Pr. Lenina. Check out the Regional Museum (5/2 Pr. Lenina) for exhibits on the region’s nature and early Russian settlements. Alternatively, continue up Pr. Lenina and take a left on Ul. Kirova towards the Khomus Museum (31 Ul. Kirova). The Khomus, or Jew’s harp, is a small instrument prevalent in many Asian cultures. Performers hold the harp’s frame in their teeth or lips and pluck a small reed, changing the pitch by the amount of air in their mouth or shape of their face. Head southeast down Ul. Kirova towards Lenin Square and Yakutsk’s Old town for a leisurely stroll and lunch. For typical Yakut food, stop along the way at Kemelok (30/1 Ul. Ordzhonikidze) or turn left on Pr. Lenina towards Tamerlan (Pl. Ordzhonikidze) for Mongolian barbecue and shashlyk. In the afternoon, visit the National Art Museum (9 Ul. Kirova) on Lenin Square to browse Russian and Yakut crafts and artwork. Once night falls, consider taking a cab just outside town to Chochur Muran (Viliusky Trakt, Km 7) where you can take in views of Yakutsk and enjoy a sumptuous dinner of typical Yakut dishes, like fish or reindeer, or stay in town and catch a show at the Sakha Theater (Pl. Ordzhonikidze). If you’re visiting Yakutsk during the warmer months, take a river cruise on the Lena. Just a day’s trip downstream from the city lays the Lena Pillars Nature Park, a dramatic series of limestone pillars that was recently declared a UNESCO World Heritage Site. Book a tour through askyakutia.com or one of the travel agencies downtown. Just south of Yakusk is Orto Doidu, a nature center on the way to the town of Pokrovsk where visitors can see animals from throughout the Far East. During summer in Yakutsk, get some relief from the heat at the Permafrost Kingdom, a tourist attraction just outside town in a 150 meter deep system of tunnels where the temperature never rises above -5°C. The center provides information on Yakutsk’s permafrost and has ice sculptures, a slide, and bar serving vodka in glasses made of ice. The museum provides clothes to withstand the winter chill inside. Try to plan your trip to the Sakha Republic during one of its festivals. On the last weekend of every June, people from all over Yakutia gather in the village of Zhetai, just outside Yakutsk, for the annual festival of Ysyakh where locals don traditional costume and put on dances and performances. During winter, visit Yakutsk in late March and hire a car to take you 650 kilometers north to Oymyakon, believed to be the coldest inhabited place on earth, for the Pole of Cold Festival which includes music and reindeer races.